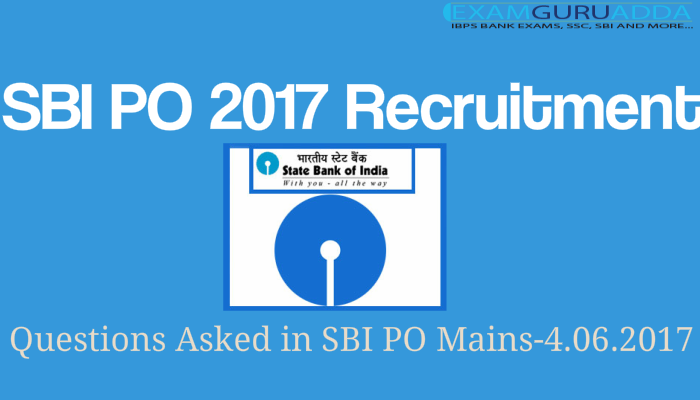 Dear Readers, we are providing you questions asked in SBI PO Mains exam 2017 based on students feedback. 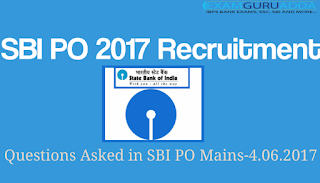 Dear Readers, as you know, SBI PO Mains 2017 exam of shift -1 is over. we are providing questions asked in Exam. 1. What does increase in Repo rate signify? 3. First Licensing Expo 2017 of India held in? 4. For small banks, the stake of promoters for the first 5 years should not be less than ____, as per RBI guidelines. 6. GDP pegged at what % of the fiscal deficit target? 9. What amount will be paid by Finland as monthly income to unemployed citizens? 11. What was the amount of India's military expenditure in 2016 as per SIPRI report? 12. What is the cheque, written by drawer and dated at some point in past called? 13. What is the target of digital transactions under UPI, USSD, Aadhar Pay and IMPS for 2017-18? An offense of tax evasion would be considered a non-bailable act, if the amount exceeds ____, as per GST guidelines. 14. Satish Kumar is related to which field of sports? 15. Who is the head of IBBI committee? 18. Headquarters of IDRBT is located in? 19. JLF framework has been formulated by RBI to? 20. Who is the head of FIFA Governance Committee? 22. What is the new base year for WPI? 23. What is the capital limit for Asset Reconstruction companies? 24. Who is the chairman of committee for reliable employment data? 25. How much amount has been allocated for MGNREGA scheme under the union budget 2017-18? 26. Question related to Payment Bank. 28. How much fund has been allocated in the Union budget 2017-18 for electronics development?